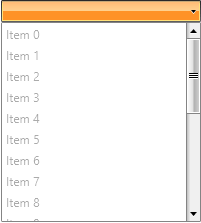 In the simplest scenario you will have a RadComboBox populated with static data in XAML. The RadComboBox and RadComboBoxItem classes expose a property named IsEnabled. Set this property to False, when you want to disable either the whole RadComboBox or specific RadComboBoxItems. The next code-snippet shows you how to do that. Using RadComboBox with static data is the simplest scenario. However, in most of the cases you will have a RadComboBox populated with a collection of business objects. In this case you have no other options except for using either the ItemContainerStyle or the ItemContainerStyleSelector. The next example shows you how to set the ItemContainerStyle of a RadComboBox. Note that in this case all RadComboBoxItems will be disabled. 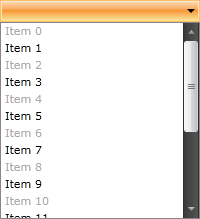 However, you have the ability to determine which items to be disabled based on your custom logic. Check out the next section to see the solution. The StyleSelector provides a way to apply styles based on custom logic. For more information about the StyleSelectors take a look at the DataBinding topics in the Common help section. The next example demonstrates you how to achieve this. 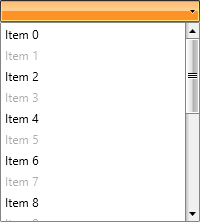 And the result is that every odd item is disabled. Two things should be mentioned here. First, note how the IsEnabled property is bound in the Style. Second, the declared Style is set as a ItemContainerStyle of the RadComboBox. The result is shown on the image below.